Navigate to Appearance → Customise → Site Identity. Click the ‘Save & Publish’ button. You can choose to upload a site logo which will automatically replace the site title text. Under the Site Logo section click on ‘Select Image’. Choose the image or logo from your media library or select the ‘Upload Files’ tab to upload a new file. Edit the Site Description or to remove it completely delete the default text. The Favicon or Site Icon is the tiny image that appears next to your website address in the browser. Icons must be square and at least 512px wide by 512px tall. WordPress will allow you to crop the image you are uploading if it exceeds the recommended size. Under Site Icon click the ‘Select Image’ button. Choose the image or icon from your media library or select the ‘Upload Files’ tab to upload a new file. Here you can adjust the colours of the text and links in the sidebar and the main content area independently. Navigate to Appearance → Customise → Colours. Click on the ‘Select Colour’ bar and use the colour picker to choose a new colour. Click the ‘Default’ button to return to the theme’s default colour. Click the ‘Save & Publish’ button when you are happy with your choices. In this section you can change the colour of your sidebar and main content area. Should you wish, you can even add an image to the main content area and one to the sidebar. Navigate to Appearance → Customise → Backgrounds → Sidebar Background. To choose a background image click the ‘Select Image’ button. Choose the image from your media library or select the ‘Upload Files’ tab to upload a new file. Set the background settings to suit your image. Navigate to Appearance → Customise → Backgrounds → Main Background. Inxhibit supports up to four custom menus, each can be displayed with or without a title heading. You can add pages, posts, custom links and category archive links to the menus. Custom menu settings can be found under Appearance → Menus or under Appearance → Customise → Menus. Click ‘Create a New Menu’. Enter a Menu Name and click the ‘Create Menu’ button. Under Menu Settings check one of the Theme locations (e.g. Primary Sidebar Menu) press the ‘Save Menu’ button. Select Pages, Posts, Custom Links or Categories from the left and click ‘Add to Menu’. Repeat this step if you wish to add additional menus to the remaining three menu locations. You can choose to display a title heading above a menu. Navigate to Appearance → Customise → Menus → Menu Titles. Add your title into one of the four provided fields. To delete simply remove the text and click the ‘Save & Publish’ button. Your Home page can display your latest blog posts, any static page, or one of the three portfolio templates detailed in the next section. To create a simple static page follow the steps below. Create a new page, navigate to Pages → Add New. Give your page a title and add some content. Choose this new page as your static Front page under Appearance → Customise → Static Front Page. If you still wish to use the blog, you now need to create a second new page and title that page, though you don’t need to select a page template or add any content. Navigate to Appearance → Customise → Static Front Page and choose this page as your ‘Posts page’ in the customiser. 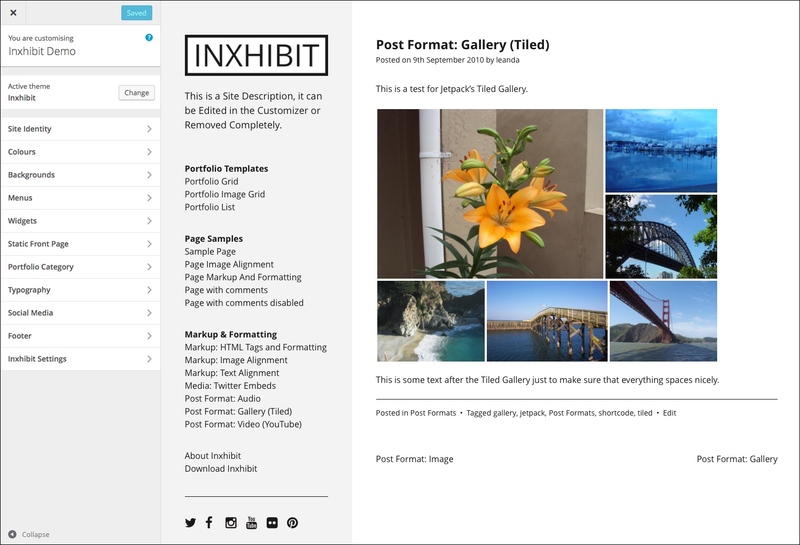 Inxhibit provides you with three templates to display your portfolio posts. These templates can be as your Front Page or as portfolio pages elsewhere in your site. Portfolio Grid: Displays your posts in a four across thumbnail grid with the title underneath. Portfolio Image Grid: Displays your posts in a masonry style image grid. Portfolio List: Displays your posts in a blog style format without any metadata. Give your page a title (you can leave the content area empty). In ‘Page Attributes’ under the setting ‘Template’, choose which of the three templates you’d like to use. You must then choose a Category to use for your portfolio posts, see the next step. Any page which uses a portfolio template can be set as your Front Page – see the section above ‘Creating a Static Front Page’. When using one of the three Portfolio templates you’ll need to choose a dedicated Category in order to group your posts together. This tells the template which category to use for your portfolio posts. If you’ve not already created a category, navigate to Posts → Categories and add a new category. Navigate to Appearance → Customise → Portfolio Category. You can also choose to exclude this chosen category from your blog posts by navigating to Appearance → Customise → Portfolio Category and checking the Exclude Portfolio Category box. This will ensure that your Portfolio posts do not appear in your blog. You can control how many posts to display when using one of the portfolio templates. This feature overrides the WordPress ‘Blog pages show at most’ setting found under Settings → Reading. Under ‘How many posts’ add the desired number. Inxhibit includes hundreds of Google Fonts to choose from, the most popular fonts appear at the top of the menu. If you already have a Google Font in mind, start typing the name of that font in the box to search. You can independently choose a font for headings and a different font for the body text. Navigate to Appearance → Customise → Typography. Select a Heading font and Body font combination using the dropdown menus or search for a font. Adjust the Font Size to suit the chosen fonts using the slider. The theme supports adding links to popular social sites with icons in the sidebar. Icons are available for, Twitter, Facebook, Instagram, YouTube, Vimeo, Flickr, Pinterest, SoundCloud, LinkedIn, Vine, Dribble, Behance, and GooglePlus. These social links do not appear on the simpler mobile view, they are visible when the site is in full desktop mode. Navigate to Appearance → Customise → Social Media. Enter the URL to your account for each service for the icon to appear in the sidebar. Use the checkbox ‘Show Social Links’ to hide/show the links. You may change the footer text, email and copyright information. Navigate to Appearance → Customise → Footer. Enter your email address and the theme will convert the characters to HTML entities to block spambots. Leave this field empty if you do not wish to display an email address on the footer. Enter your new text here to override the default Inxhibit credits. Use the checkbox ‘Show Footer Text’ to hide/show the footer text. Enter the new copyright text without the © symbol or date, the date will change automatically at each turn of the year. If you want to cust­o­mise the Inxhibit theme further and you need to edit the code in the stylesheet (style.css) or theme tem­plate files, we strongly recommend creating a child theme so that any modifications are not overwritten when Inxhibit is updated in the future. See here for more information about creating a child theme. A permalink is the permanent URL to your posts or pages. By default they may look like this http://www.inxhibit.com/?p=123/. To improve aesthetics you can adjust the settings to achieve a pretty permalink, for example http://www.inxhibit.com/portfolio/. Navigate to Settings → Permalinks. Under ‘Common Settings’ choose the ‘Post Name’ option. You can disable comments by default, this will apply to any future posts published. You can disallow comments from posts and pages that have already been published. Navigate to the Post or Page. Uncheck ‘Allow comments’ in the Discussion panel. If you can’t see this panel you can switch it on from the ‘Screen Options’ tab. Navigate to Settings → Discussion. Uncheck ‘Allow people to post comments on new articles’. Inxhibit supports a widgetized sidebar. Customise the sidebar area, located underneath the menus, with WordPress widgets to display categories, tags, search, etc. Please note that widgets do not appear on the simpler mobile view, they are visible when the site is in full desktop mode. Navigate to Appearance → Customise → Widgets. Drag available widgets into the Sidebar area. Inxhibit supports Jetpack Plugin Tiled Galleries which can be placed into posts or pages. Make sure you have the Jetpack plugin installed and the Tiled Galleries module is activated in your Jetpack settings. Insert a new WordPress gallery into the post or page using the ‘Add Media’ button and select ‘Create Gallery’. Select the images to include in the gallery and click ‘Create a new Gallery’. From the ‘Type’ dropdown select ‘Tiled Mosaic’. Click the ‘Insert gallery’ button. Inxhibit provides you with the option to hide the post author from your post templates. Navigate to Appearance → Customise → Inxhibit Settings. Uncheck the box to hide the post author. BackUpWordPress: Simple automated backups of your WordPress powered website. Wordfence: The Wordfence WordPress security plugin provides free enterprise-class WordPress security, protecting your website from hacks and malware. If you have an active licence you will receive dashboard notifications when a new version of Inxhibit is available. Ensure you have backed up your theme files and database before running the updater. The WordPress antispambot is available in this theme, this function converts any email addresses used in posts or pages to HTML entities to block spambots and prevent email addresses from being harvested. To use, instead of creating a mailto: link on your email addresses simply wrap the email address in the email shortcode as follows.